A period-costumed stilt walker entertains a crowd of 500 during the picnic en blanc on Court Street. Most entered the picnic’s spirit by dressing in white. The third annual celebration of Castine’s French heritage brought well over 500 people to Castine on Bastille Day, July 14. 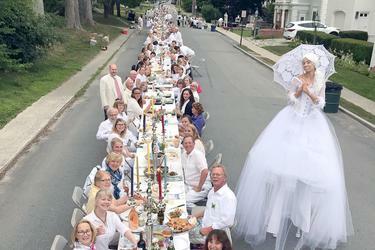 A string of events held in honor of the national day of France culminated with a picnic en blanc on Court Street followed by the Bangor Symphony Brass Quartet performing on the town common—“the highlight of the day,” co-organizer Sue Macdonald said. For those who didn’t fit at the end-to-end tables lining Court Street, the town common accommodated the overflow. Live music, from Mike and Susie Fay, and Henry Erhard, accompanied the picnic, which boasted seating for 470 people. 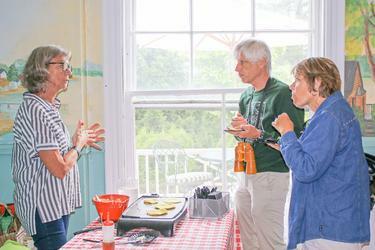 For those who arrived in Castine early, a French toast breakfast and lectures, including former Adams School principal Todd Nelson on connecting Castine with French village St. Castin, with students crisscrossing the Atlantic for visits and Saint-Castin’s mayor visiting during L’Hermione’s port of call on Bastille Day in 2015. Since L’Hermione’s visit, Castine has celebrated Bastille Day, recognizing its French and Acadian historical ties. Events throughout the day included an open artist’s studio in the Annex on Water Street, French master painting for children and French vanilla ice cream at the Wilson Museum’s Hutchins Education Center, and French cooking demonstrations (and treats) at the Castine Inn. With lobster beignets, and ployes hot off the griddle, this was a popular stop. “About 200 people came through,” Macdonald said. 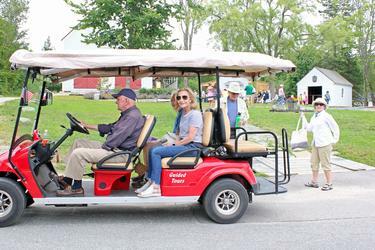 The Castine Golf Club offered a free all-day flag golf tournament, the historical society a guided walking tour and Dyce Head Lighthouse opened for tours during the afternoon. Castine Kayak Adventures also made three kayak tours available. 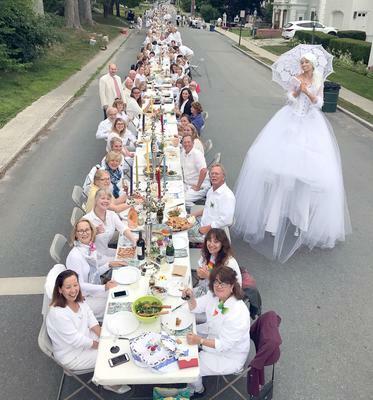 A silent auction of a painting and five prints of the 2017 picnic en blanc by Castine artist Josh Adam raised over $1,000 of the proceeds for next year’s Bastille Day, Bishop said. This year’s events, all free but the kayak tours, were supported by individual and business donations, sponsorships and a grant from the Maine Community Foundation. “I think all in all—and I heard it twice from people, that it was the best event in Castine—people really enjoyed it,” Bishop said. Visitors sample and find out about ployes, a French flatbread, above, and lobster beignets at the Castine Inn. Scarlett, Castine’s slow-moving transport, drives visitors from the town dock to Court Street and the Wilson Museum, above, courtesy of driver Gordon MacArthur. 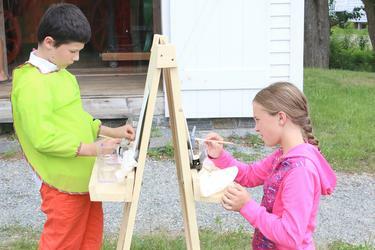 Young artists, inspired by French master reproductions, paint on the Wilson Musuem’s Hutchins Educaiton Center lawn.